A big congratulations to the winner of the Hoot Owl Hoot! Cooperative Board Game sponsored by Peaceable Kingdom. Sarah says: I learned that Peaceable Kingdom strives to make their products from sustainable and eco-friendly materials. Love it! This was a joint giveaway with Code Name: Mama and Natural Parents Network. Entries from both sites were combined and a winner was chosen using Random.org. 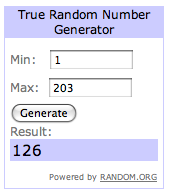 The winner entered at Code Name: Mama. The Hoot Owl Hoot! board game, designed for children over age 4, helps to emphasize basic game-playing skills, color matching and recognition, teamwork, cooperative play and strategy. The game has simple rules where the players take turns choosing cards and moving owls. 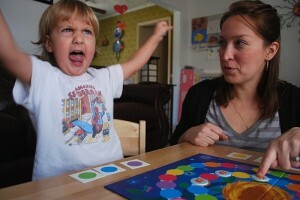 Play time is relatively short and leaves a positive feeling among the players. If you weren’t the lucky winner, you can still purchase this game on the Peaceable Kingdom website. 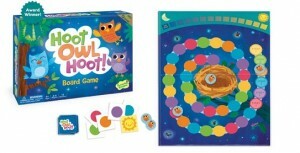 You can also buy Hoot Owl Hoot! from Amazon for $14.99. Peaceable Kingdom’s other cooperative games are Count Your Chickens!, Stone Soup, Lost Puppies, and Mermaid Island. 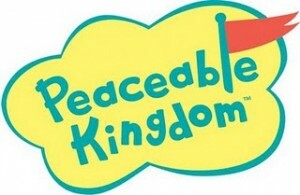 Check out the Peaceable Kingdom website. Sign your child up for the Peaceable Kingdom Birthday Club. Disclosure: Our reviewer received the Hoot Owl Hoot! board game for this review/giveaway.